From Victorinox Switzerland arrived 2 flight cases with a system booth kit to be set up at shopping malls all over the country. After a trial set up in Tokyo, the program started in “the Factory” in Sapporo in August. 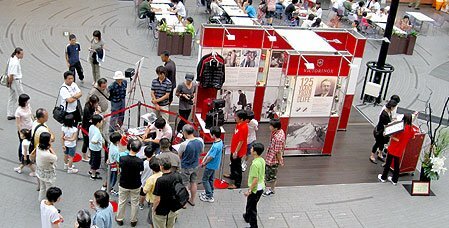 We covered the transport logistics, the over night set up and also had sales support staff on site to promote the booth and the “Activity” event, where the secrets of knife assembly were shown by a craftsman in front of the visitor’s eyes. The project management and the discussions with the shopping mall managers of the next 7 locations went parallel as the booth moved from town to town. It all started 1884, when Mr. Karl Elsener opened a knife manufacturing company in Ibach-Schwyz. The hit product would be the legendary Swiss Officer’s knife, which conquered the world as the “Original Swiss Army Knife”. Nowadays the product range includes also kitchen cutlery, time pieces, travel bags, fashion and perfumes to build a complete out door lifestyle brand.